At just 9mm high the Seagate GoFlex Slim is currently the world's thinnest portable hard drive - it's 38 per cent slimmer than the current GoFlex ultra-portable drives. This 7200 RPM drive is USB 3.0 compatible (backwards compatible with USB 2.0), so you benefit from fast transfers if your PC or Mac has a USB 3.0 port. You can also connect the GoFlex via SATA once you've unplugged the USB adaptor. Should you want to connect the drive via FireWire or eSATA, you can buy separate adaptors. The supplied 18" (45.7cm) mini USB 3.0 cable is fine for laptop use but for desktop PCs, or if you want to connect it to your TV without it dangling from the back, you may want to pick up a longer one. 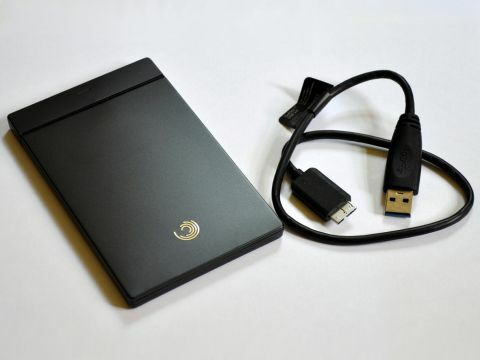 The Slim works on both Mac and Windows, with an NTFS driver for Mac preloaded on the drive. If you want to use it with Time Machine, though, you'll need to reformat it to HFS+. Also preloaded are automatic backup software, folder sync software and encryption. The drive is encased in a matt black anodised aluminium shell which looks better than plastic and gives it a pleasingly solid feel, though it does pick up fingerprint smudges very easily. When first plugged into a USB port the drivers install within seconds and then you're good to go. If you want to use the supplied software you can install it from the drive. A small white LED at the back of the unit shows that it's powered up. The Slim is virtually silent in use. When placed on a wooden desk in a quiet room there was a barely audible buzz as the drive spun, and despite a lack of vents, it remained cool to the touch. We benchmarked the GoFlex Slim over both USB 2.0 and USB 3.0 connections, using ATTO Disk Benchmark. Not only is the GoFlex Slim small enough to sit unobtrusively alongside a laptop or to pop into a laptop bag pocket, but its size and good looks make it ideal to slip onto an already crowded TV stand so you can connect it to your TV or Blu-ray player. The GoFlex Slim has a price tag of around £80, so it'll cost you more than a higher capacity and slightly more portly drive from Seagate's original portable GoFlex line. A 1TB GoFlex Ultra-portable, for example, can be picked up at Amazon for £70 (though if you want to connect it via USB 3.0 you'll have to splash out for an upgrade cable). So if capacity is your priority you can get more storage for less cash, but if you're after a portable hard drive that's small and good looking, then the GoFlex slim is a good buy.